Confessions of a 40k addict: Apocalypse Wow! My local GW - Southport has recently had a new manager start, and as mentioned there will be an Apocalypse battle against the newly reawakened Necrons on the 19th November. So we've got together a 1,500pt force [as per instructions]. It's prety much our standard list but I wanted to try out the two Primes, and the Mycetic Spore. We ummed and ahhed over Zoanthropes, Rippers, more Hormogaunts and the Biovore and in the end managed a bit of each just minus the Zoanthrope. 'Madness' some may say but he's currently broken and although their the only real anti-tank we have I don't think it's worth it to pin all our Monolith killing hopes on the big brained bug. The Biovore was also not a first choice but having heard some reports about the danger of the new Scarabs I can see his pie-plate blasts coming in handy to thin out those things, so he came back in. The Rippers may be surprising considering my past thoughts but I wanted to finish the other two bases of them but in the end thought just the three, and the Biovore was a better option. I ran the maths versus more Hormagaunts but realised I could have 4 Hormies or 3 Rippers and although there's less option to claim objectives the increased wounds may make them more of a pain to the Necrons. So long as I can keep them in Synapse of one of my creatures, probably the Trygon Prime after Tunneling then at least they won't start eating themselves! 1499pts. 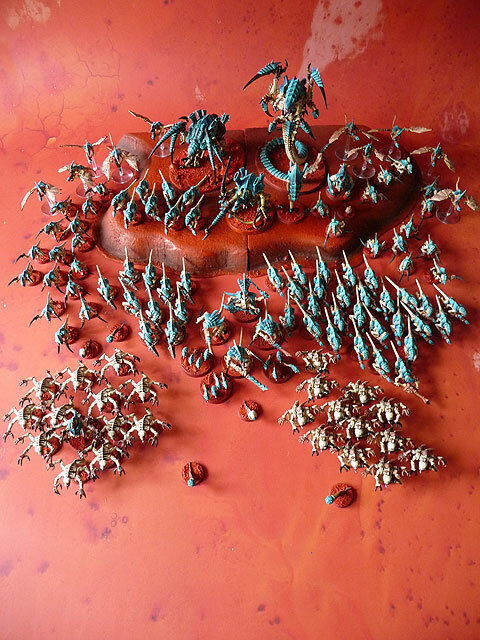 68 figures [7 Synapse creatures] although some will be deep striking. The CC Prime will most likely join the Hormagaunts. I think the Trygon will be deep-striking but we'll decide on the day. I'll take pictures and report back after the event. Hooray for a non-spam list; looking forward to reading how this does. Thanks Ghostin I'll got on it, picture taken, report [such as it is] to follow. No spam here, we play for fun.